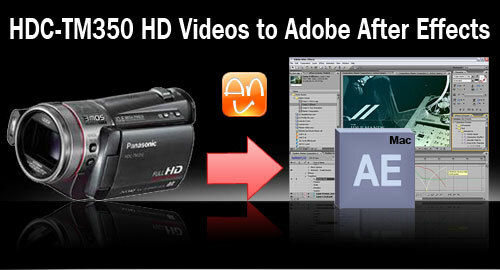 With this problem, you may want to get an effective way for smoothly editing the AVCHD files in Adobe AE. Aunsoft MTS/M2TS Converter for Mac is such a great program, which solves the problem and converts Panasonic M2TS to WMV3 for Adobe AE on Mac OS X. The videos play perfectly without choppy scrolling or interlaces. Have a look at the following steps and enjoy the perfect conversion from Panasonic AVCHD camcorders to Adobe After Effects. Step 1. 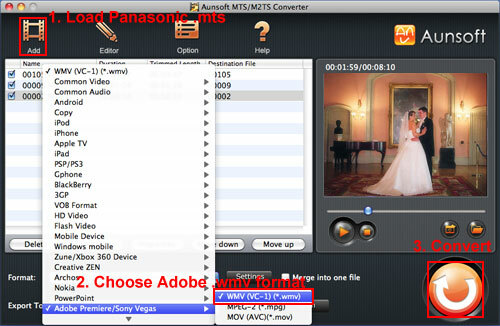 Load Panasonic AVCHD videos to Aunsoft MTS/M2TS Converter for Mac. After transferring .m2ts files from Panasonic HDC-TM250 to Apple hard drive, just run Aunsoft MTS/M2TS Converter for Mac as the Mac Panasonic M2TS converter, and click the "Add" button to load .m2ts videos for conversion. Click the "Format" option, and choose Adobe Premiere/Sony Vegas > WMV (VC-1) (*.wmv) for converting Panasonic M2TS to HD WMV for non-liner editing software like Adobe Premiere, Adobe After Effects with WMV3 as video codec. Step 3. Convert Panasonic AVCHD to WMV3. Click the convert button under the preview window, the Mac Panasonic M2TS to WMV converter starts transcoding 1080i/1080p M2TS to WMV3 for editing in Adobe After Effects at high definition. After the conversion, it is easy to edit 1920x1080 HD videos in Adobe After Effects on Mac OS X like Tiger, Leopard, and Snow Leopard.